In the John Wayne film, McClintock, George Washington McClintock (Wayne) saw Mrs. Warren, the housekeeper and cook (Yvonne DeCarlo) going up the stairs of the McClintock residence and offered a hand in ‘helping’ her up in his somewhat inebriated state. As they near the top, they lose their balance and tumble back down the stairs, with Mrs. Warren landing on top of him. The commotion brings out Katherine McClintock (Maureen O’Hara), estranged wife of G.W. and when she sees the situation at the base of the stairs, her eyes blaze with indignation. The film is a somewhat rare exception for Wayne as almost an entire comedy, and is one of my favorites of his; yet how many times has the Spirit of the LORD brought back to my mind those words when my circumstances look suddenly disappointing, bad, grim, tragic etc. All too often in life we can fall under the sway of our circumstances and become discouraged by what we see all around us; we become despondent of any good coming from the situation, when all along we have God’s Word assuring the saint who is walking in His ways, that He has good in store, and even the bad situations He is going to work out for our good (JER 29:11; ROM 8:28; 2 COR 5:7). ~ We are constantly challenged to see any given situation in life from one of two different perspectives: the NATURAL or the SPIRITUAL. God lamented often over unspiritual Israel for their hearts that didn’t understand Him or His ways, and refused to hear His Word, but insisted upon their own ways (DEUT 32:28-29; ISAIAH 6:9-10; 58:3-5,13; PSALM 95:10). The LORD Jesus was likewise exasperated at times with His unspiritual disciples who often were clueless of what He was trying to teach them (MATT 15:16; 16:11; LUKE 18:34; JOHN 14:9). Are we, the church of the LORD Jesus Christ, going to believe what we see in the natural realm with natural insights or are we going to believe God with spiritual understanding and perception in the light of His Word and by His Spirit which are our counselors and guidance? Will we allow circumstances or the Word of God to dictate our view, our actions and reactions? In the domain of spiritual warfare, it’s just the same challenge, and even more so when the “enemy comes in like a flood” – are we trusting in the LORD to raise up that holy standard (which denies the enemy his strength, impoverishing him of power)? Certainly there is much today that would seek to rob us of our peace and joy in the LORD, that would inspire fear, insecurity, doubt and despair; just look around at the affairs of State in this country, and at the world at large! We know that the LORD’s return is quite soon; there are so many signs of biblical prophecy coming to pass today, its hard to keep up with it all (On TTUF we have just recently included another tab; this one on “BIBLICAL PROPHECY” where we have posted - and will periodically update - reliable articles, audios and videos that go into details regarding eschatology and its ramifications in our world today!). We have a very limited time of opportunity to share the Gospel with the lost and see souls ushered into the Kingdom before the Father observes that the church is complete (“the fullness of the Gentiles” as in ROM 11:25) and any endeavor to deliver these souls from their present citizenship in the kingdom of darkness will meet with severe hostility from our enemy, now more than ever! Even in our abilities to provide for our families we are being challenged today as financial resources are depleting, job sources are drying up, wages remain stagnant while prices for the basic necessities of life climb relentlessly upwards. The enemy can do much to instill icy cold fear, paralyzing dread and numbing anxiety into the minds of God’s children. Or perhaps our church is being infiltrated with the insidious doctrines of demons, and our imploring towards our pastor goes unheeded; we are being continuously looked upon as “judgmental, unloving, contentious, splitting theological hairs, Pharisees, etc.” by our fellow church members, and we search in vain for a church that will teach the pure Word of the LORD . . . and nothing else! This is the narrow road of truth, absolute, inspired truth as found in Scripture alone. Satan will use any and all means to get us, in this dire hour, to doubt and mistrust El Shaddai, the “God of Almighty provision”, and His Word. Whatever our challenge, the Scriptures provide answers to any dilemma we might face and the power of the Holy Spirit to realize them in our lives! For this segment on OT Examples of Spiritual Warfare, I’ve selected two readings from two prophets of Israel: Elijah (1 KINGS 18) and his successor, Elisha (2 KINGS 6:8–7:20). Both of these men of God faced great challenges and opposition from the perilous powers of darkness and their palpable puppets whose strings Satan is keen on pulling. Both are examples to us to . . .
Judge [discern] not according to the appearance, but judge righteous judgment. See also these scriptures regarding spiritual discernment and revelation from God - MATT 16:17; DAN 2:22; AMOS 3:7; 1 COR 2:9-10. In this part we will examine the passage from 1 KINGS dealing with Elijah (whose name means “Yahweh is my God”), the prophets of Baal, Ahab and Jezebel; and in the second we will look at the passage from 2 KINGS where we see shall Elisha, his young servant and the host of the Syrian armies. Elijah the Tishbite (Tishbi, a region of Gilead to be differentiated from another Tishbi in Galilee; Tishbi of Gilead bordered on Arabia) is first seen in 1 KINGS 17.
. . . As the LORD God of Israel liveth, before whom I stand, there shall not be dew nor rain these years, but according to my word. This pronouncement was in accordance to God’s Holy Word of warning to Israel, that if she should forsake the LORD their GOD, then He would afflict them by depriving the land of rain (DEUT 11:17; 28:23; LEV 26:19). God then miraculously provides for His prophet at the brook Cherith, but once the brook dried up, the LORD directed Elijah to the house of Zarephath of Zidon (a Gentile woman) where not only his needs, but the needs of this widow and her son who were nearly starved because of the drought were also miraculously provided for, even to the point of raising her son from the dead! Zarephath declared after witnessing her son raised to life that . . .
. . . Now by this I know that thou art a man of God, and that the word of the LORD in thy mouth is truth. And Ahab called Obadiah, which was the governor of his house. The days of drought were extreme in a land known for its arid climate to begin with; it actually lasted for three and a half years according to the epistle of James (JAMES 5:17), and it rightly reflected the condition of Israel herself – she was barren, dried up, unfruitful and not receiving the water of the Word of God (EPH 5:26), even refusing it, and rather preferring the pagan proclivities of Ba’al worship and other idols that Ahab and his heathen wife, Jezebel introduced to the Hebrew nation, causing them to apostatize. For more on this passage from 2 PETER and being stirred up in our love and fervency for the LORD, and standing firm, not shaken, on the ROCK see the following article. The aforementioned knowledge of our LORD Jesus Christ that brings spiritual fruitfulness and plenty comes by God’s Word alone. Yet the church today is rejecting His Word much as Israel did in the days of Elijah, and as a result they are suffering spiritual drought, poverty and famine (AMOS 8:11). … I have not troubled Israel; but thou, and thy father's house, in that ye have forsaken the commandments of the LORD, and thou hast followed Baalim. The Scripture says, Woe to him that calls good, evil and evil good, that puts light for darkness and darkness for light (ISAIAH 5:20) and this reversal is seen quite clearly in Ahab’s remark. Elijah’s desire to turn Israel away from the paganism of their leadership and back to the Living God is perceived as “trouble” by Ahab! It is also seen in our relativistic society, among our political and religious leaders, where good and bad as well as truth itself are measured by one’s own sense of morality (JUDGES 17:6; 21:25), apart from any standard whatsoever, let alone the holy standard of God’s Word! Yet a standard is being raised today by the forces of darkness poised as ‘change agents’ and ‘new spirituality’ leaders; these 'troubadours of tolerance' that proclaim that EVERY way is the right way: except for those who would declare that there is only ONE Way – those are the evil ones of “intolerance, hate, narrow-minded bigotry and judgmental attitudes”. The world is gathering together all of its components to form a global unity, led by religious forces diametrically opposed to biblical Christianity. It would appear that we are drastically outnumbered! I’m sure that Elijah felt the same way; in fact I know he did eventually. Yet at this point the prophet of the LORD is empowered and ready for a classic ‘show-down” like we have all seen in those old Western movies as the good guy and bad guy go slowly pacing down the town street, ready to draw and fire. Elijah will likewise ‘fire’ as we shall soon see (and the pagan priests of Baal . . . ‘misfire’?)! Note that Elijah is not going up against the four hundred and fifty prophets of Baal only, but an additional four hundred prophets of the groves. These groves were high places where trees were carved into shapes of gods and other profane images used in worship according to pagan traditions. Could you picture yourself going up against eight hundred and fifty adversaries, every one of them hostile opponents against Jesus Christ, the Bible and Christianity, but yet maintaining a perspective of unquestioned victory? Even without the one hundred prophets, hidden by Obadiah in a cave (where were they anyway? Why didn’t they join with Elijah in this great contest? ), Elijah was prepared to conduct himself in this great trial, confident in his God and able to stand for His Name’s sake. It would seem that Ahab was likewise confident for his side, because he willingly gathers together the prophets of Baal to meet Elijah, and of course there is the eager audience of the nation of Israel who, no doubt, were quite interested in how this would turn out. It’s sad that after such a challenge, that “the people answered him not a word.” What apathy or hard-heartedness is this? What calloused indifference is demonstrated by these who are supposed to be the people of the Living God? Where was their zeal, their passion, their love for the LORD their GOD? I am reminded of something a pastor said (more than once) to us, the congregation: “If the world has what you want, don’t waste your time coming here in church, GO FOR IT! If you think you can find satisfaction, peace, contentment, joy, and love anywhere in this world, why do you need to come here for those things? Yet, if you know in your heart that this world doesn’t hold any answers for you, then why even spend any of your affection on it? Why not give yourself wholly and completely to the LORD Jesus Christ?” And to that may I add a hearty AMEN! The word used “halt between” in the Hebrew means “to stagger” as one who is in a drunken state; a meanderer who sways first one way, then the other, with no sure direction, no steadfast stride, no steady and balanced walk at all, but a life of compromise and half-way obedience, and almost half-hearted devotion (JAMES 1:6-8). But could you hear your spouse saying to you, “I love you dear, with half or even most of my heart”? You would wonder where the remaining part of their heart was, wouldn’t you? This is why David cried, “Unite my heart to fear Thy Name” (PSALM 86: 11). He wanted to share his reverential love and honor for the LORD with NO ONE and NOTHING else! It wasn’t that Israel didn’t worship YHWH or pay Him homage at all; they just had other gods that they liked to worship too. They were ‘ecumenically correct’ and seeker sensitive towards pagans who might find worship of YHWH alone distasteful or even offensive. So while they rejected the Word of the LORD, they would still retain the worship of YHWH (but in name only) – an outer shell of piety and dedication, but without sincerity and genuine faith: a “form of godliness, but denying the power thereof” (2 TIM 3:5), precisely as we see in today’s apostatizing church. They worship another ‘Jesus’ but they reject the Word of God. So now we find ourselves on Mt. Carmel; a challenge has been raised and opposing forces are gathered together: in the minority we have 850 false prophets, the king of Israel, and an apathetic nation; in the majority we have 101 holy prophets, minus 100… and the LORD God Himself! Let us remember these kind of odds any time we feel outnumbered, or cornered by ‘overwhelming’ numbers and recognize that the One that we are allied with measures this universe in the span of His Hand! Hear the words of Elijah the Prophet! 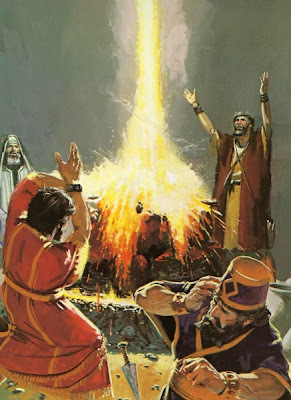 I’ve been told that ancient pagan priests of various religions would secretly heat rocks and then erect an altar above them, so that when they added oil-soaked wood, the heated rocks (which would appear normal) would combust the wood into supposedly miraculous flame. If that’s true, the prophets of Baal didn’t have any opportunity to conduct a covert deception by ‘prepping’ the rocks of any such altar they erected. Everything was done in the sight of the king, Israel and Elijah the prophet of the LORD. Only a genuine, supernatural display of power would be allowed in this show down. Put on the whole armor of God that ye may be able to stand against the wiles of the devil. For we wrestle not against flesh and blood, but against principalities, against powers, against the rulers of the darkness of this world, against spiritual wickedness in high places. Wherefore take unto you the whole armor of God that ye may be able to withstand in the evil day, and having done all, to stand. And so it begins: Elijah tells the Baal prophets to ‘choose your weapon’ as it were, and call on the “names of your gods” but to refrain from adding fire to the altar. “Leave that for your gods to do”, he was basically saying. These false prophets realized they were in a quandary: they couldn’t conduct themselves as they had formerly done, with their sleight of hand and trickery. Even if they had witnessed some form of demonic power in spontaneously igniting the wood for their sacrifices, such powers were apparently forbidden from doing so here by the LORD Himself. God would not allow any ‘god’ and their spiritual power to receive any glory whatsoever, only He and He alone will ever be so glorified for all eternity! For in reality, there are no gods, only the LORD God – this could include Allah, or Brahman or the many various gods of Hinduism, or Mormonism, etc. which are not deities but if anything, spirits and fallen angels. Note the tact, the sensitivity, the respect with which Elijah gives to these of another religion! Rather, here we have the prophet mocking the false prophets and the lies that surround their worship of false gods, and rightly so. This is so contrary to the tolerance and ‘dialoguing’ between those that claim to be ‘Christ-followers’ like Brian McLaren, Doug Pagitt, and Rob Bell (Emergent leaders) to try to find common ground, and agree to join forces with those of other religions, such as the Dalai Lama and . . .
“I will be part of the Seeds of Compassion event in Seattle April 14-17…. I am extremely excited about this event. Rob Bell is the only other friend who is part of the portion of the event I am part of, but the other panelists look terrific. “So what is Seeds of Compassion? “Anchored by the deep wisdom of His Holiness the Dalai Lama, this community–focused event celebrated and explored the relationships, programs and tools that nurture and empower children, families and communities to be compassionate members of society”. “There are those that would argue that this was a secular event. However the Dalai Lama is unquestionably a religious leader and innumerable sources describe the event as an interfaith event. Not just a conversation between people of different faiths, but an effort to bridge the gap and make spiritual connections. “… the whole day listening as the panel discussed compassion, interfaith dialogue and respect, hope in the midst of despair and destruction, and the inviolability of the self”. “For more information see Rob Bell - Emerging Church Leader or Fully Emerged Apostate? This is a policy and practice unknown to Elijah, or to Moses or Paul the Apostle for that matter; but this is common fare among today’s so called evangelicals and self-professed Emergent leaders. When the answer from Baal was not forthcoming, these prophets started getting REALLY serious, and began to cut themselves so that their blood was pouring out of their bodies as an offering. It’s worthy of noting that among various sub-cultures, especially the heavy metal (and like) groups, it’s a common thing for fans to use razor blades to cut their arms and hands. Likewise in Satanic cults, blood offering is made to incite powerful magick and the interaction of demonic power. Some have even suggested that the infants aborted under the auspices of Planned Parenthood (formerly The Birth Control League) of Margaret Sanger are dedicated to ‘the gods that be’ (See - Theosophical Quotes). These false prophets were at it all day long, well past afternoon and into the evening; nothing at all happened. Elijah was probably patiently doing his finger nails, casually waiting for his turn . . . Observe how the prophet is now rebuilding the altar of the LORD – due to neglect, it had fallen into disrepair and he took twelve stones, representing the twelve tribes of Israel; each and every one whose place was rightfully at this altar, for they were (and are!) a peculiar (specially chosen) people of the LORD. It’s considered spiritual adultery to worship anything other than the LORD God, especially for the Christian. We must each of us consider whether the altar of God in our hearts is in need of repair due to neglect or another ‘god’ who has stolen our affection and dedication from our LORD and SAVIOR. Worship is not a ‘Sunday morning thing’; it’s a life style that should be as natural and as fluent as breathing. Such worship if it’s to be acceptable to the LORD must be in accordance with the Spirit and with Truth. No sacrifice of worship can be accepted unless it is accompanied by atonement for sin. It was true for Abel (GEN 4:4) and for David (1 CHRON 16:29) and for our own admittance into the church whereby we are even able to approach the holy throne room of the heavenlies and there worship God, but by better sacrifices than of bulls and goats (HEB 9: 23-28); and worship of God by the sacrifice of ourselves (ROM 12:1-2). Worship is most certainly a form of spiritual warfare as Satan hates the exaltation of the LORD God at his own expense who deems himself worthy of such. As we become like that which we worship, worshiping Jesus Christ is obvious in its vital importance and benefit for the disciple of the LORD of Glory. Now getting back to the text: why did Elijah build a trench around this altar? What was this for? We will find out now! This was certainly not part of the agreement! In the instructions by the prophet there was no mention of water being poured out over the sacrifice. This was not something Elijah insisted upon the Baal prophets, but only by the prophet upon himself. Imagine the consternation of all that observed this – both Israel and the Baal advocates; how was this sacrifice supposed to burn now, being drenched with water (a precious commodity by the way, seeing that the drought only just ended)? No problem for the God of all creation! Here is a perfect picture of worship according to the Spirit of Truth (again, the Word is typified often as water)! Did you catch what Elijah said in his prayer? Usually when we read about the patriarchs, we read them as Abraham, Isaac and Jacob; and yet here the third patriarch is named Israel; why is this? Once Jacob had wrestled with the angel of the LORD and the dawn came, and with it the blessing of the LORD on this man’s life, his name was changed (GEN 32: 24-28). This sometimes occurs in scripture – where at a landmark of spiritual significance in the life of a person, they receive a new name or a variation of the old one – such as Abram becoming Abraham, Sarai becoming Sarah; Jacob is renamed Israel; Cephas becomes Peter and Saul becomes Paul. A name in Hebrew culture represents a characteristic whereby the person may be known. This is why there are so many names (titles, actually) of the LORD – for He desires to be known by His people. Here in the midst of this terrible apostasy, God is referred to as the God of ‘Israel’ which intimates that even though His people were fallen from Him at this time, His view of and His promise to them is that they will brought to spiritual life and blessing (EZEK 36:26-38). Such promises are granted to those also who are true members of the body of Christ (PHIL 1:6). And as for the prayer itself, note that it’s because of the prayer of this righteous man, that much was availed in Israel that day – God was glorified, the gods of the enemies of Israel were disgraced and seen as utterly powerless before YHWH. Though Satan would have squelched any such opportunity if he could, the prayer of Elijah intervened on behalf of his people, thwarting by the power of God, the plans and deceptions of the enemy. We cannot always see the fruit and effects of our prayers, but we do know that those prayed in accord with God’s will ARE ANSWERED – in God’s timing (LUKE 18:7; 1 JOHN 5:14). This is the essence of spiritual warfare, and it’s not a quick-fix solution! This is a long term enterprise that requires patience, diligence, and sensitivity to the Spirit of God, as well as a compassionate heart that yearns for the lost, the empowerment of the saints and to see God glorified above all. We need to pray for our pastors and church leadership, for our brothers and sisters, for those who herald the gospel and God’s Word – that they may do so without compromise, without adding to or taking away from the message that God would give them through the Holy Scriptures, to deliver to the people (JER 26:2); for the lost souls that have believed any of the myriad falsehoods paraded by the enemy, that God would open their eyes and turn them from darkness to His Light (ACTS 26:18). I can’t imagine the intensity of that fire of the LORD – it not only consumed the wood and the sacrifice, but also the water . . . and even the stones were consumed! Indeed, our God is a consuming fire (DEUT 4:2; HEB 12:29). His Spirit consumes the sinful nature from the life of His saints in salvation (sanctification) as they yield to Him; it also consumes the ‘life’ of the unrepentant sinner in Judgment. Such a fire from God indicated that the offering was acceptable to Him there on Mt. Carmel that day. Though all Israel was in such a deplorable state, the life of this one man, this prophet of the LORD had an impact as he worshiped God by sacrifice. The people fell on their faces and proclaimed the LORDSHIP of YHWH. Yet even here, we still see the ties of apostasy because they said “The LORD, He is God” rather than “The LORD, He is OUR God”. However, the time will come when “all Israel shall be saved” when the Messiah returns at His Second Advent, and God will prove faithful to bring His people to that point where their salvation will be realized. In our own day, as we contest the pluralism and apostasy that’s all around us, we Christians are tempted to remain mute, to just ‘go with the flow’ and ‘co-exist’, when in all actuality we are the Light of the world, according to the LORD Jesus Himself, and we ought not to be hid, but stand in a place for all to see, as His faithful witnesses (and in some parts of the world, His martyrs as well - “witness” in the Greek is martos). See also various TTUF articles and videos on apostasy found here. Elijah commanded, and the people obeyed, in gathering up all the prophets of Baal, and slaying them at a nearby river; the prophet then told Ahab to leave for “the abundance of rain” was coming”. When righteousness is declared and upheld, God will bring blessing; when one saint stands alone against the tyrannical tide of deception, compromise and evil, they are used by God as a burning brand to bring Light and to scorch satanic hindrances and scatter them: God is glorified and He often arrests judgment and brings blessing. The abundance of rain did in fact come for Israel and the drought was fully at an end, but the ramifications of such were still felt because the region was still suffering from extreme famine. Yet God was and is faithful to provide from His hand of grace, for His people, as we shall soon see in the life of the prophet Elisha in part two of this article!